Mine is perfectly clean right? Well it doesn't look that way according to a 2011 study from NSF International. They do independent studies for consumer health. They found that about half of coffee makers (we're talking the classic, basket-and-carafe kind here) had yeast and mold growing in their reservoirs. About one in ten were home to coliform bacteria. On average, home coffee reservoirs also had higher germ counts than both bathroom door handles and toilet seats. A household germ specialist from the University of Arizona, Kelly Reynolds, agrees with the study. 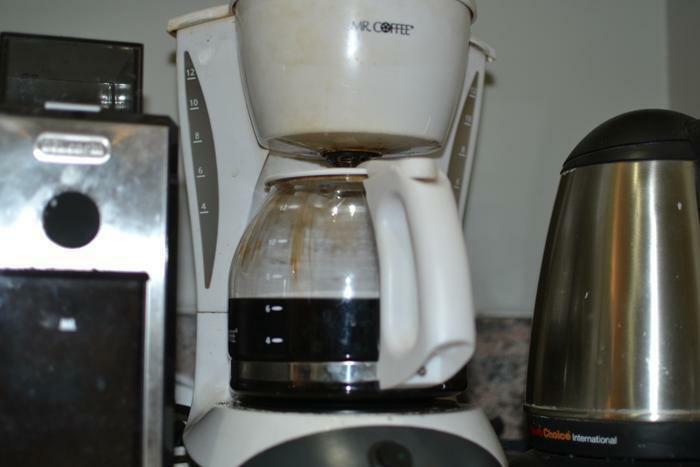 "Coffee makers are certainly a moist environment where mold and bacteria are known to grow in high numbers; our bodies can deal with them, but at some point they'll grow to levels high enough to cause sickness," she said. Wonderful -- a nice shot of bacteria every morning. Keuring makers and the like aren't much better for you, it turns out, Terri Newcom, a Purdue Extension director, said. I thought it was supposed to be a bit bitter. Perhaps I am a mold aficionado and don't know it? The problem for you is drinking mold spores -- the things you don't want growing in your home. They can cause respiratory problems as well as gastrointestinal problems such as bloating, gas and diarrhea. Use a clean cup every time you use your K cup or similar brewer because a dirty cup can add bacteria to your machine. Pull out the vinegar. It's not a creamer replacement but it is that one industrial clean-everything cleaner in your home. White vinegar can get rid of sediment buildup. Pour it through a few cycles of your machine. You should do this every few months. If you have the classic coffee maker, the carafe, lid and filter basket should be cleaned daily with warm, sudsy water. For the classic model, you also need to clean the brewing chamber. Use half water, half vinegar and fill the water chamber. Using a paper filter, allow to brew until half the chamber is empty. Go through a couple of cycles by letting the water rinse through using a paper filter. Turn it off and let it sit for a half hour then finish brewing. Then use a new filter and brew a clean pot of water -- do it 2 times. Fill the carafe with warm soapy water and add a little rice as an abrasive. Swirl it around. Use a sponge and remove any debris in the pot. Rinse and dry it! You now have coffee minus the extra bacteria flavoring.